Here at Morah Supplies we love to hear from you! Contact us via email at contact@morahsupplies.com for an email reply within 2-3 business hours, or contact us via telephone at 347-463-2614 for a phone call reply within 4 business hours! 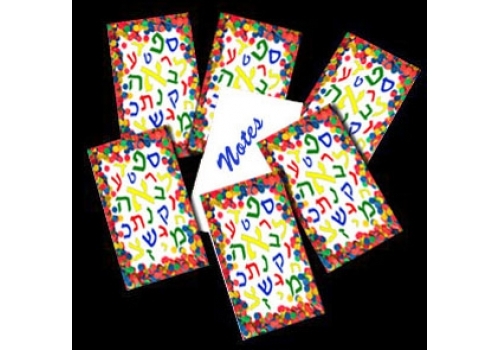 Aleph Bet mini notepads, with a unique Aleph Bet design that is full of color! Put these in a classroom prize box or a party goody bag! Don't miss out on this wonderful item! Comes in a pack of 12. Each notebook contains 20 sheets of paper. Each notepad measures 3.75" x 2". As an early childhood educator, Morah Mushkie knows what works in the classroom. Clear, clean, eye catching without being too busy and easily adaptable.